Not many people are expert in editing photos in a professional way. Where on the other hand, there are many people, who need it but don’t have enough time on hand to edit the photos to fulfill their necessities. If you are a blogger or is looking for a great banner for the purpose of advertisement of your blog, you don’t need to be a Photoshop expert or master of any advanced software. Yes, smart work actually pays off. You don’t even need to have the basic knowledge of photo editing, as you can get your dream banner, directly from the internet, and that too without copyright issues. Canva.com is one of the best websites, where you can not only make banners for different purposes, but by using some little tricks, you can also design a logo for your company or startup, and use it as long as you can, as all the designs, which you can make on the website will be provided to you will come with a Creative Commons license, which means you will never face any kind of copyright issues, with the content. 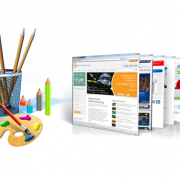 On Canva.com, you can get the option to make a variety of attractive designs, made for various purposes. 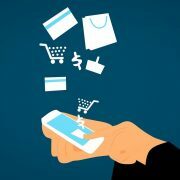 You can make banners for Facebook ads, Facebook cover pics, Facebook apps, Blogger banners, Twitter banners, and many more. Once you choose a particular canvas type, a new canvas will open in front of you, with the appropriate size. You can create your own canvas, with the size you want. 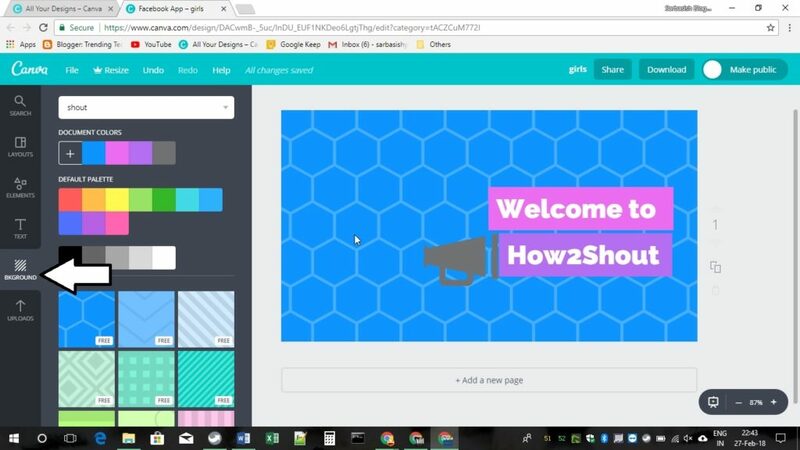 Let’s have a look at, how to make a great design or a banner, with Canva.com. Visit Canva, and the website is www.canva.com, and click on “Log in”, to log in either with your Facebook, or Google account. 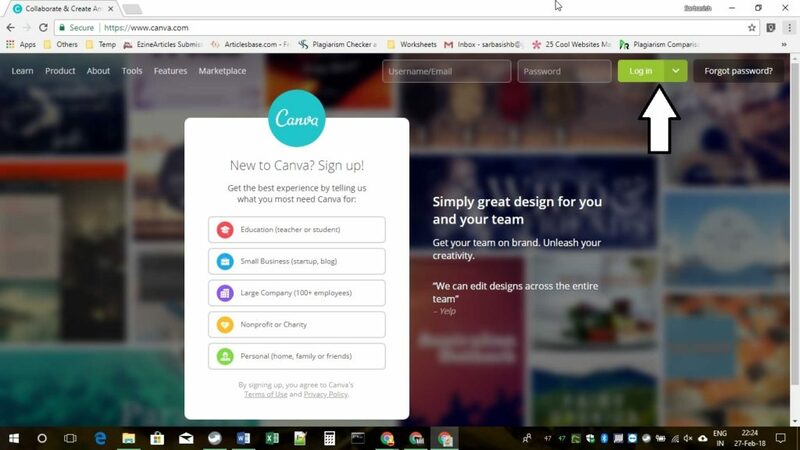 For the first time, you will have to allow the process of linking, and once it is done, you are ready to use Canva, with your credentials. After you log in, you will have to click on “Create a design” on the top left corner. On doing that, you will get a plethora of exclusive templates, which is available on Canva. You will fall in love with the templates, and a huge collection of objects, which can help you present your work, or express yourself through your work, in the most appropriate way. Let me choose “Facebook app” for the tutorial, on clicking on “Facebook app”, you will show you a huge collection of sub templates once again in a new tab, where you can choose the most appropriate one for yourself. In the page above, you can edit all the elements, depending on what exactly you need. Instead of “girls weekender club”, I will write “Welcome to How2shout”. It is quite easy. 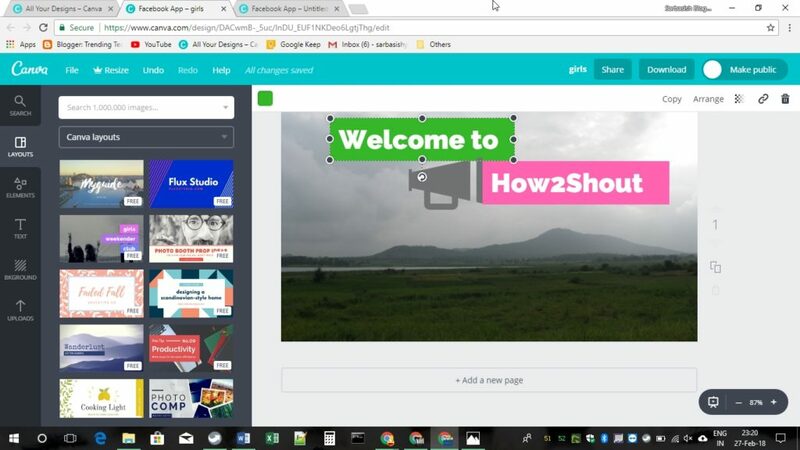 Click on the text, erase it, and replace it with “Welcome to”, in the first block, and “How2Shout” in the second one. I removed the third block, as it is of no importance. The final result is shown below. It’s not the end yet. Why not choose a background! On Canva, you can find a number of free images to use as background or other purposes, and some of them are even paid. If you are fall in love with the paid ones, you can purchase them for $1 or $2, or you can use the images, with a Canva.com watermark. I am using my own photo, and before using that, I will have to upload that to Canva. Just go to “Uploads” in the left panel and click on “Upload your own images”. 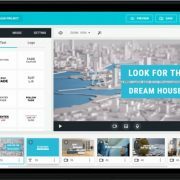 Select the one you want to upload, in order to get started. 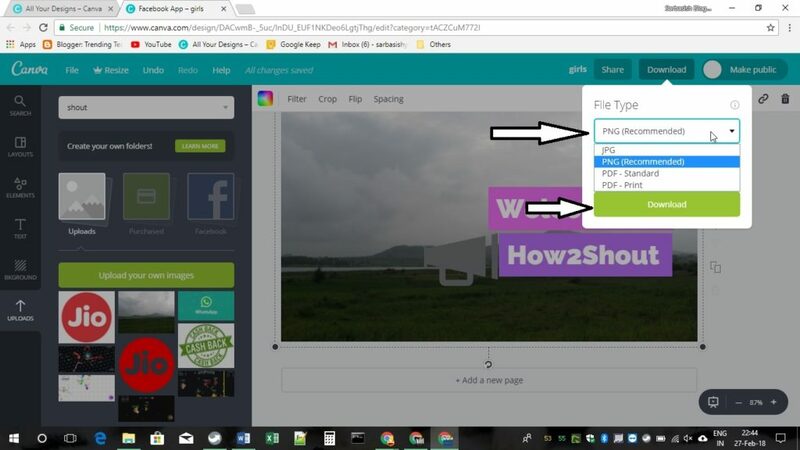 Click on anywhere in the background and hit the delete button to remove the existing background and use the customized one. Now drag the newly uploaded photo and drop it to the background, and it is done. 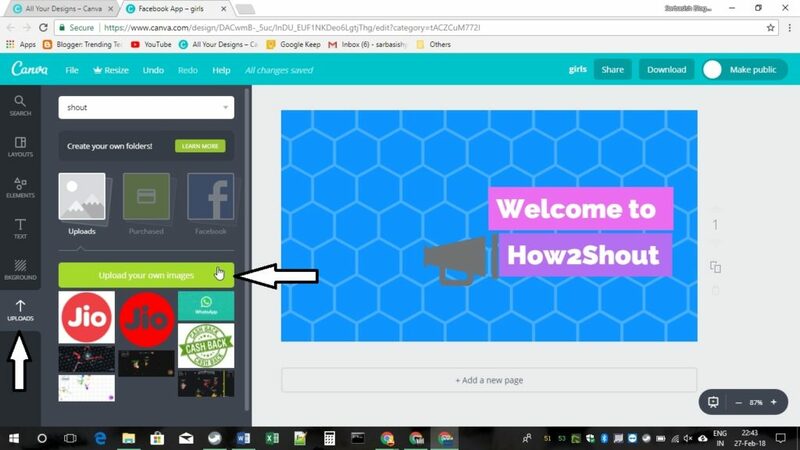 Now, once you are done with the editing stuff, click on “Download” on the top right corner, choose the format, and click on the Download button. Downloading will take some time, as the images come with great details, and the resolution is pretty high. 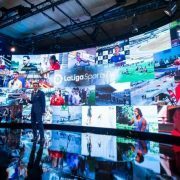 Now, you are free to use the images anywhere. You can also check the license if you want to use it for different other purposes. 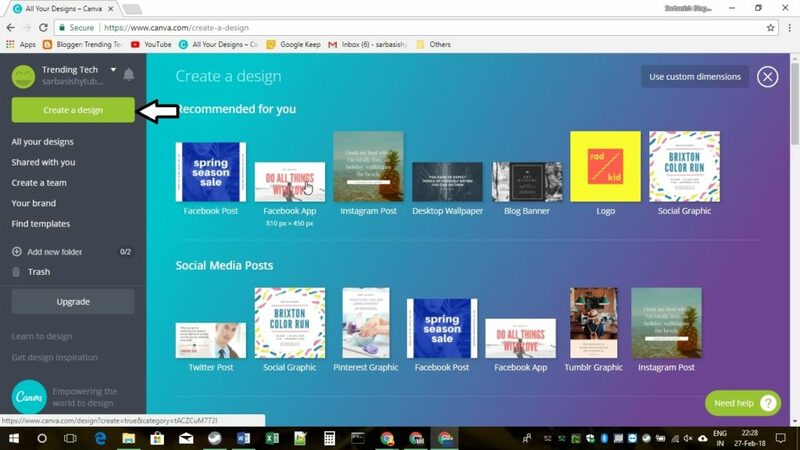 Apart from the normal editing illustrated above, you can even add a number of elements, and edit a number of other things, with Canva. You can even reallocate the blocks to different places depending on what you need. There is also the option to change the color of the blocks, by selecting it and choosing the color, from just above the canvas. See the image below to find the changes. You can even add a number of elements, like illustrations, shapes, icons, and many others, by opening “Elements” from the left panel. I added the loudspeaker icon from “Illustrations”, within “Elements” only. You can even add the text of your desired type font, and size, from the “Text” section on the left panel. Here are things, you can edit, within the text. You can even add a single colored background, or a background with textures, from the “Background” panel on the left. 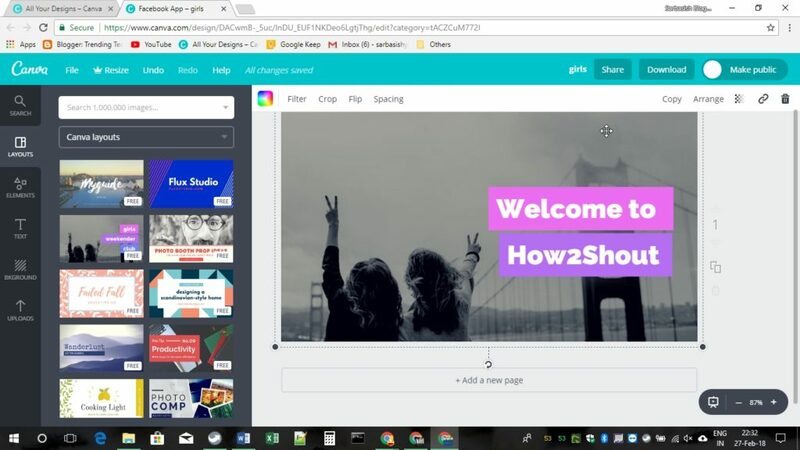 Canva.com is a vista of possibilities if you want to get the best designs with minimum or no knowledge of photo editing. 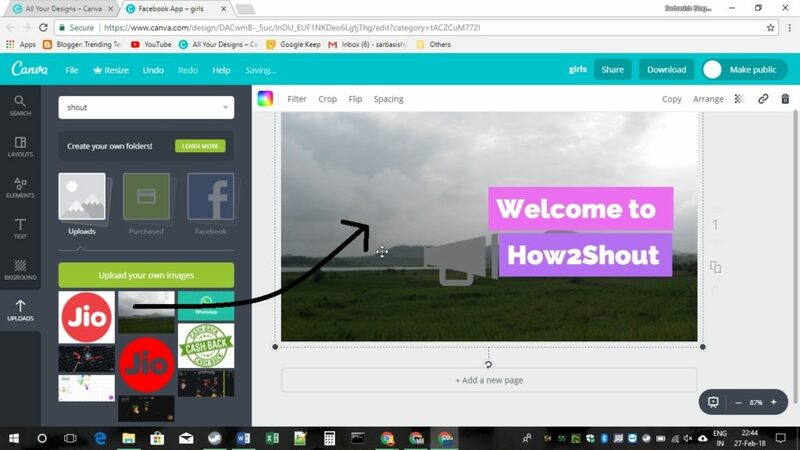 If you want to use the app intensively, you can also be a premium member, and can even download the Canva mobile app, to edit while on the go. With some little tricks, you can even make your dream logo for your new startup, or the most eye-catching logo for your blog. There are huge possibilities. It’s all about how well you can handle it.